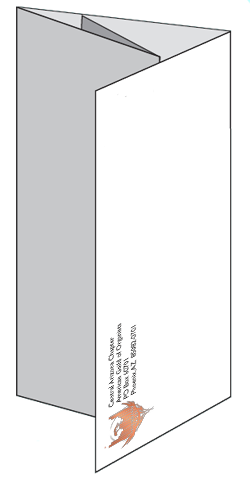 This (legal, 8.5x14") color document is formatted to be printed in landscape orientation and 2-sided on plain paper. NB: Select the "Actual Size" option in the Print dialog. The brochure is designed as a 4-panel left-to-right roll fold. Start with the inside (What is Poe? Scholarships. Registration) facing up. There are tick marks in the top and bottom margins, in addition to the dashed cut-line, which will aid in folding. The POE mailing and artwork panels should end up on the outside of the folded brochure.